I don’t really remember much of August. It’s all a blur of words and revisions and paper and a computer screen and the sound of typing. I do remember eating more than my fair share of the simple, elegant caprese salad, a salad that one simply can’t have at any other time of the year than late summer. 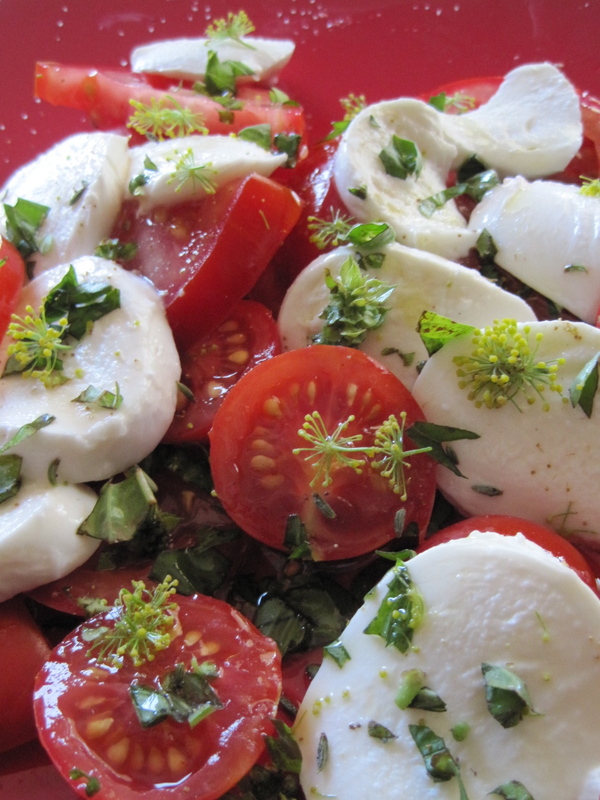 It is a sensible salad: no lettuce filler; sweet, vitamin C-filled garden tomatoes, sliced so that the juice leaches out with salt; little mozzarella balls that add a milkiness to the dressing and some heft to the mouth; olive oil; a bit of vinegar; black pepper; and herbs. One generally chooses basil, but I capriciously added fresh fennel dust and seeds, wild marjoram, oregano, parsley…anything that seemed good at the time. Don’t be afraid to smush a tomato slice or two to make a creamier, tomato-ier dressing. Those little fennel flowerettes look so gorgeous on the salad. Congrats on the PhD! Congratulations on your doctorate! You give those of us still deep in the process hope… as an interested party in the UO English dept., what will you be teaching? Congratulations on your new degree! I know two eager candidates at the U of O who expect to defend their dissertations before the end of the year–both in physical therapy.